On twitter you will encounter a set of functions available to all twitter users: the favorite, the retweet (or RT), and reply. There are other options available, but these three will be your primary focus going forward. 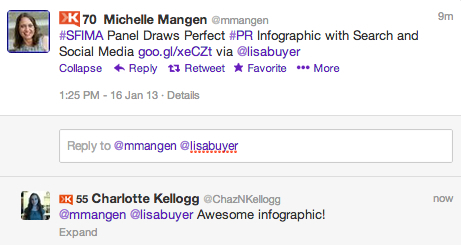 Replying to a tweet is as straight forward as it sounds. 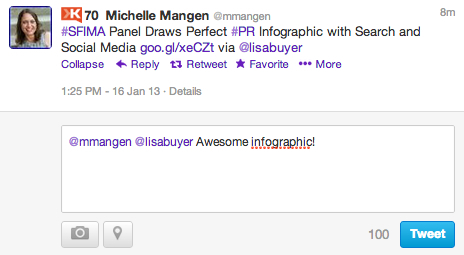 So here I have clicked the ‘reply’ button and chosen to commend Michelle Mangen on this cool infographic. So what I’m going to do is type in my response and hit enter. This is the result. This will not show up as part of a ‘conversation’ on twitter. It is publicly viewable, and can be interacted with by followers of both users, and by the general public. Now that you know how to retweet, reply, and favorite tweets, your homework is to find up to 5 tweets you like, and retweet and favorite them. If you really like it, send the user a polite reply. How to get people to follow you. Great service. Thanks for your coaching! Have been tweeting for awhile and started a blog last year (vbouvier.wordpress.com), but helpful to get reminders and guidance on how to do more with these tools.